NEW! 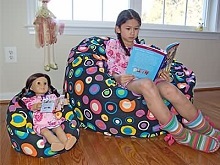 Matching Girl-Doll Bean Bags! Totes ship out the next weekday. Transit time is normally from 1-5 weekdays. * Add Name or Initials? Due to technical issues, product descriptions are not appearing. Please use the helpful links below. Copyright © 1998-2019 Ahh Products. All Rights Reserved.